Jan’s childhood friends are coming to town for the Quilt Festival this week end. I am planning to make a Japanese dinner on Friday night, so I decided to make pickles. I went to the Japanese store for supplies and thought why not have Japanese tonight. I have just been diagnosed with diabetes, so I need to start reducing the sugar in my recipes. I am trying to counter the loss in flavor of the vinegar/sugar reduction by introducing some lemon peel. The last time I added lemon peel to cucumber pickles I had shredded the peel finely, but they added almost no flavor. Today, I am going to zest the peel. After Dinner Note: The zested lemon peel was a good choice. The flavor boost was substantial, but not over powering. 1. Thickly slice the cucumbers on the diagonal and toss them with the salt. Let them sweat for half an hour. Tip: If you have a problem with high blood pressure you may want to reduce the salt. 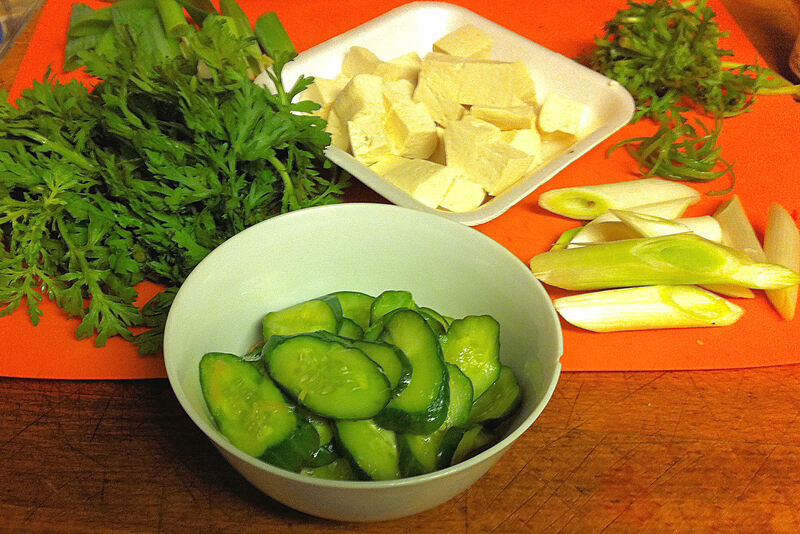 For reduced salt pickles, discard the brine that has formed and rinse the cucumbers. Note: Do not use the last half inch, near the steam, of the cucumber. It can be very bitter and spoil your pickles. 2. Put the vinegar, mirin, and sugar in a small pot and add 1/3 of a cup of water. Bring the pickling sauce just to a boil to dissolve the sugar. 3. Add the ginger and lemon zest to the cucumbers and pour the sauce over it. 4. Mix well and put the mix into a pickling container. Tip: If you do not own a tsukemonoki (a pickling container with a press; 漬物器), you may use a small round seal-able plastic container, a plate that is just slightly smaller and a weight of some kind (like a rock). Do not use a lead weight, or other uncoated metals, as the vinegar might react with it and spoil your vegetables. You could also put the pickles in a seal-able plastic bag and put a weighted plate on top. 5. The pickles will be ready, as lightly pickled cucumbers, after two to three hours, but will be even better after two or three days.